Even if you do not want to use these chemicals it is important to understand why they are used, and how specifically they provide protection to bathers. There is nothing wrong with exploring alternatives to the mainstream accepted methods for anything...but when it comes to pools, and especially hot tubs, you need to be aware of what you are gambling with. Without any chance for confusion, poorly treated hot tub water can kill you. It can cause infectious respritory diseases which can be fatal, as well as harboring dangerous pathogens and bacteria like flesh eating bacteria or brain eating parasites. Now that we have that ugly business out of the way we can start attempting to answer your question. Before now I did not know whether you understood that pool and spa water can literally kill you if you mismanage it..but now that you know what the real risks are you can continue looking for alternatives to chemicals like chlorine and bromine...if you still want to. When put in this morbid context the importance of this pursuit is called into question. Is it really worth trying to reduce your exposure to "harmful" chemicals if this potentially can make you sick or even kill you? Perhaps over exposure to chlorine factored over the lifetime of someone with a pool or spa could result in DNA mutations or respritory ailments...but failure to sanitize your hot tub water can kill you before the end of this year. To a certain degree you could call this fearmongering but from another perspective, if you tried to grow dangerous bacteria how would you do it? Keeping bacteria warm, wet and dark would be the best method I can think of. You might have already decided that you want a chemical free hot tub but you really need to respect the potentially dangerous variables involved with a stagnant, hot water environment. 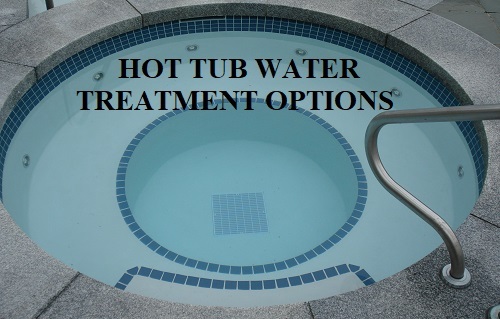 The hot tub treatment options that are available to you will depend on how far from the conventional path you wish to stray. There are many forms of hot tub chemical alternatives on the market but all of them have the same problem. Every last chlorine alternative in hot tubs is missing at least one of the four levels of protection listed above. If any alternatives became available that were able to satisfy all four levels of protection then they would also become accepted mainstream alternatives to chlorine and bromine. As of now there is not, though there is a lot of hope for the future in this regard. The swimming pool industry is undoubtedly entering a golden age of sorts where technology for finishes and plastics and epoxies and even peripheral sanitation equipment are advancing quickly. Ozone systems - Ozone systems work by adding unstable o3 into the water. While this definitely helps to keep the water clean and safe, no matter how effective it is it lacks the ability to build and hold a residual value in the water. This means that any potentially dangerous pathogen or bacteria introduced to the water will continue to live until such time that it passes through the filtration system and contacts with the injected ozone. Further to this the amount of contact time the bacteria has with the ozone directly affects how well the ozone works. In total this leaves the door open for potential infection and contamination between bathers that simply does not exist in a properly balanced chlorinated or brominated pool or spa system. UV lights - UV lights are the other current go-to peripheral items to help with sanitation of pools and spas. Similar to ozone, the UV does certainly help to deactivate bacteria and viruses in the water, but can not work until the water is sent through the filtration system and ultimately passed in front of the UV light. While UV lights are highly effective at keeping water safe they simply are not a stand alone solution in a chemical free hot tub. The issue of trying to maintain a hot tub without chemicals is not simple. Just because you stop using chlorine or bromine does not guarantee that you will get sick and die...but it absolutely increases the chances. How much are you willing to risk in order to avoid small amounts of chlorine or bromine? What if there was a better way? Well, there is, at least according to myself and other swimming pool and spa industry experts as you can read about in this article on alternatives to chlorine in swimming pools. In short, better management of the existing sanitizers allow for maximum protection with minimal chemical exposure. Consider the subject of regular oxidizer use in bromine hot tubs as discussed in this video. Correct management of the water results in far less bromine exposure. 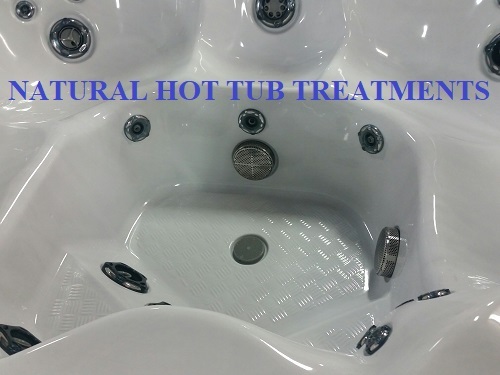 The best natural hot tub treatment is the one that provides the maximum amount of protection with the minimal amount of chemicals being added to the water. When I tell you that it is not safe to run your hot tub witout chemical sanitizer this is not because I make money when you buy chlorine. 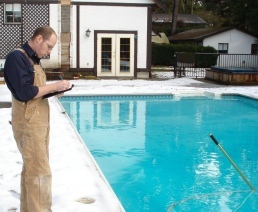 I work with pools and spas for a living and have devoted years of my life to learning about how to safely manage pool and spa water. 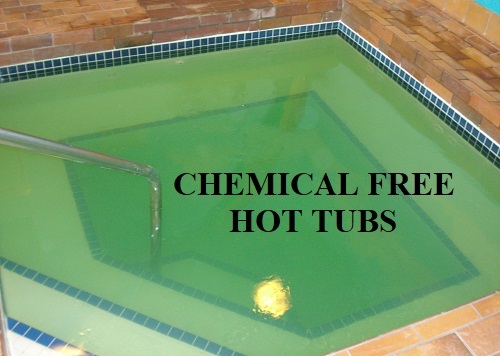 If you arrived at this article looking for alternatives to chemicals in your hot tub then don't simply click away when I am not giving you the information you want. I am in a position of authority to tell you why you need chemical sanitizers, and the risk that you are introducing with your resistance to this is literally life and death. The real answer that you are looking for is to add a peripheral device like ozone or UV to your hot tub, and then maintain the lowest possible chlorine or bromine levels that still protect you. When effectively implemented you can easily reduce your chemical exposure by over 90% - well over - and your total risk remains dead flat at zero. This is a really, really good compromise. Don't simply discount this option because it still involves chlorine or bromine and you want to find a way to operate your hot tub with no chemicals at all. However, if you are set on running your hot tub without chemical sanitizer then there is only one system on the market that I would look to in order to be able to accomplish this. The answer you have been searching for - A new piece of technology was developed for pools and spas and very few pool or spa owners seemed to notice. AOP, or advanced oxidation process, is the closest thing you can get to a chemical free hot tub. It uses a hydroxyl radical generator to introduce unstable and highly reactive hydroxyls into the water. These oxidize bacteria, chloramines and organic debris up to 1,000,000 times faster than other peripheral pool and spa systems, and even generates a short lived hydrogen peroxide residual in the water. What does all this mean? It means this is how you run a hot tub with no chemicals (or at least almost no chemicals). In fact the manufacturer Clear Comfort advertises that with their system you can operate your (residential) pool or spa without chlorine or bromine. The newly developed CCW50 AOP system from Clear Comfort is the best technology currently available to reduce on the amount of chemicals you need in your hot tub. While some people might choose to run these systems with no chemicals at all (in residential settings), because AOP is so effective, a safer option would be to run very low levels of chemical sanitizer in addition to this AOP unit. The AOP system will in reality do almost all of the real work in your spa water, while maintained low levels of chlroine help to provide a more robust residual protection. Periodic chlorination method - The Clear Comfort AOP system is so effective that some people also run their hot tubs with no chemical sanitizer, relying on only the CCW50 system, but then periodically (every few days or once per week) shock the water with an unstabilized chlorine shock. It will kill anything in the water and then dissipate. Any chloramines left in the water would be oxidized by the AOP system. You really should be using chlorine or bromine in your hot tub, even though it seems like we like in a world which is bombarded with chemicals. These ones in particular serve an incredibly important purpose in keeping you safe. You can look to find alternatives but you must realize the risk in doing so, and the limitations in the current technologies. At the end of the day if you want the best system on the market to run your hot tub without chemicals then there is nothhing better than an AOP system like the CCW50 from Clear Water. If one of my contracting clients absolutely insisted on a chemical free hot tub maintenance system or some sort of natural way to maintain spa water, then this is the system I would recommend.